Should You Turn Off Your Air Conditioner When You Leave? Debate has run rampant for years. Some homeowners believe blasting their air conditioner consistently will save money. Others argue that turning down the thermostat when the house is empty is the only way to save. Which is true? And how can you reduce your air conditioning bill this season? With hot weather just around the corner, now is the time to start thinking ahead. So, should you turn off your air conditioner when you leave? Let’s take a closer look…. Rising energy bills are no laughing matter. They can wind up costing homeowners an awful lot of money each and every month. When funds are tight and those home expenses start piling up, this can be extremely frustrating to deal with. It isn’t just the money out of pocket. There are also long-term effects on the environment to consider. With this in mind, it is no wonder more men and women are cutting back than ever before. Perhaps this is why the debate on whether to turn off or keep on the air conditioner has become so…well….heated! The best way to save money? Turn your AC down or off completely when you leave the house. There is a good reason for this. While some people believe that by keeping the AC unit running consistently, it will not need to work as hard (therefore using less energy throughout the day), this is not the best course of action. Turning your air conditioner on and off as needed allows you to save money, reduce your energy consumption, and ensure that your unit works as efficiently as possible. It has been found that your AC runs most effectively when it is going at full capacity – rather than at lower speeds. That means you can shut it off completely when you leave the house for the day and simply turn it on to your desired temperature once you return home. This is a great way to save money without sacrificing your overall level of comfort. What about when the hot, humid summer really hits? Do you enjoy the feeling of walking into a cool and refreshing home? Then use a programmable thermostat instead of turning it on and off manually. You can simply set the thermostat to turn on and off at a certain time of day. This means you won’t have to think about energy savings…. they will happen automatically! There are a few other ways to reduce your energy bill. 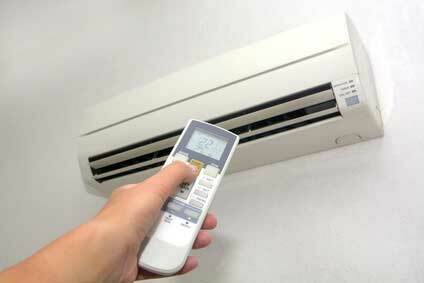 In addition to unplugging any unused electronic devices you can also cool down your home quickly and easily. Need a few ideas? When spring and summer roll around, simply get creative! Try using a ceiling fan (this will circulate the cool air better) or crack open the window (a small opening will create a draft without removing the cool air). You might also want to consider switching to an energy efficient air conditioning unit. Should you turn off your Air Conditioner when you leave the house? Yes! It can help you avoid wasting energy unnecessarily and allow you to save money at the same time. This spring and summer, be prepared. Have a plan of action in place…and get ready to save like never before. Tony Lester understands the importance of saving on your energy bill. He works for Heating Ontario and has been involved in the furnace industry for over ten years. It is his vast experience that allows him to understand the furnace installation needs of his clients.